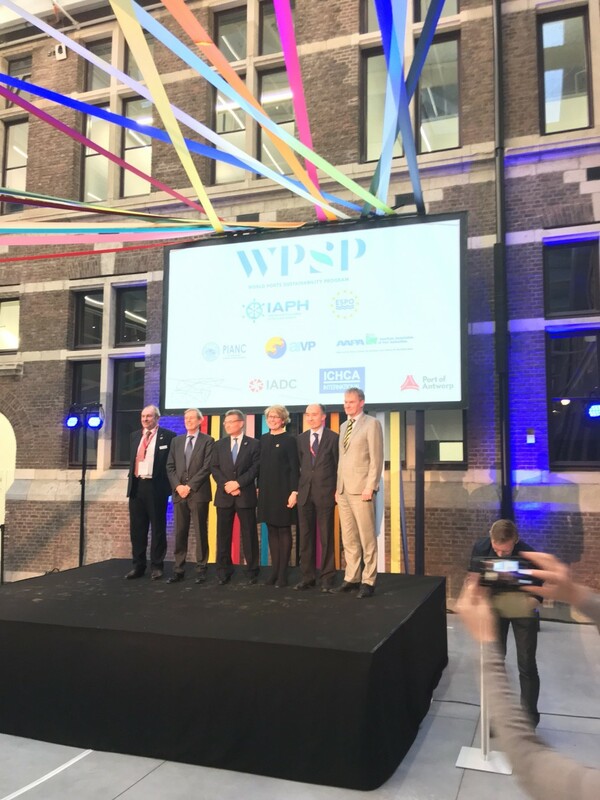 On 22 March, the World Ports Sustainability Program (WPSP) was officially launched during a high-level event gathering more than 250 professionals from the port and maritime industry and hosted by the Port of Antwerp. The event was opened by her Majesty Queen Mathilde of Belgium. The WPSP Program, initiated by the International Association of Ports and Harbours (IAPH), aims to demonstrate global leadership of ports in contributing to the Sustainable Development Goals of the United Nations. It notably wants to empower port community actors worldwide to engage with business, governmental and societal stakeholders in creating sustainable added value for the local communities and wider regions in which their ports are embedded. In more concrete terms, the WPSP aims to provide, through its website, a global library of best practices and a portal for projects and initiatives of international port-related organisations that joined the program as partners. It also aims to further become a think-tank and breeding ground for new collaborative projects and it will report regularly about the sustainability performance of the global ports sector. This work will be lead and coordinated by IAPH. The launch was marked by the signature of a Declaration signed by the five founding partners of the project: the International Association of Ports and Harbours (IAPH), the American Association of Port Authorities (AAPA), the Global Network of Cities and Ports (AIVP), the World Association for Waterborne Transport Infrastructure (PIANC) and the European Sea Ports Organisation (ESPO). It was also signed by two structural partners: the International Cargo Handling Coordination Association (ICHCA) and the International Association of Dredging Companies (IADC). As such, not only port authorities are involved in the programme but also the wider port community. In essence, the undersigned organisations endorse the 17 UN Sustainable Development Goals (SDGs), commit their respective organisations to contribute to the UN SDGs where and when possible within their own field of activity, competence and responsibility. They will do so by continuing existing projects and initiatives and by developing new ones. When possible and relevant, the organisations will work together to develop common projects. The partners also engage to recognise each other’s work and to inform each other. cruise and passenger traffic, through the ESPO Cruise and Ferry Port Network and the ESPO Network of Code of Good Practice for Cruise and Ferry Ports. By signing this Declaration ESPO engages to continue and further develop its initiatives. At the same time, ESPO is looking forward to reflecting with IAPH and the different WPSP partners on how to complement these initiatives by new initiatives that can contribute to implementing the SDGs.